Pammy Blogs Beauty: Top Ten Tuesdays: What is New at the Drugstore? 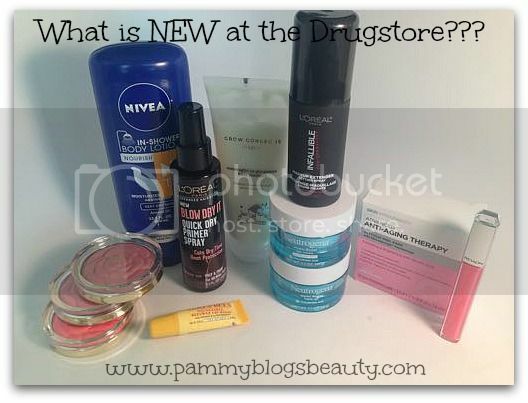 Top Ten Tuesdays: What is New at the Drugstore? It is time for another edition of Top Ten Tuesdays! This time I am sharing my picks for some of the best new products from the drugstore! Every New Year brings a slew of new drugstore products. I am in the midst of trying out so many new fun products. I love browsing all of the new product displays at CVS when I am killing time waiting for perscriptions to be ready or when I am in the store picking up some basic essentials. Here are some of my favorites that you can find at your local CVS. To find out more details about all of these new Drugstore products, please click "read more" below!!! NIVEA In-Shower Body Lotion: Finally! The drugstore has a version of one of my favorite high-end treats (LUSH's Body Conditioners). This is essential a conditioner for your body. Think of hair conditioner: you wash your hair and then condition it in the shower (to provide moisture and nourishment for your hair). Well, this NIVEA In-Shower Body Lotion does the same thing...but for your body! Here is the scoop: You shower as usual with your favorite body soap or shower gel. Next, you apply NIVEA's In-Shower Body Lotion to your whole body (skipping the feet). Then you rinse off. There is no need to apply a moisturizer after your shower...you already did that in-the-shower. So cool! I love this because it is *so hard* to apply body lotion in the winter after your shower, when it is cold! You get to apply this while in the lovely wet steam heat of the shower! Plus, it is super effective and moisturizing your body and and leaving you smelling great! I love it! I tried the Nourishing formula (it also comes in Smoothing and Hydrating formulas...must try these as well!). L'Oreal Blow Dry It Quick Dry Primer Spray: This product is a spray in hair "primer" spray that works to reduce your blow dry time. Guess what? It works! My blow dry time is decreased by about a 1/3 of the time! Plus, this primer spray provides heat protection and leaves my hair super shiny and manageable. The scent is nice, too. Love it!!! Skin + Pharmacy Advanced Anti-Aging Therapy Glycolic Peel Pads: OMG! I am so excited to see Glycolic Peel pads at the drugstore. I am a HUGE fan of a variety of high-end brands versions of a peel pad...however, they are always so pricey! So, I am super excited to see a drugstore version of a peel pad! I am currently in the midst of some other skincare testing. However, I have tried the pads one time...and as far as my first impression...I really love them! Just as good as my higher-end peel pads! As with all peel pads, I recommend spot testing them first. Milani Rose Powder Blushes: Nobody does blush better than Milani! High-end or Drugstore, Milani really is the best! This latest Rose Blush collection is gorgeous and perfect for Spring! There are 3 shades: Romantic Rose, Tea Rose, and Coral Cove. Not only are they gorgeous in the pan with their imprinted Rose design, but also they have a natural finish, are super pigmented, and are long-wearing. You just have to grab one (or all!) of these next time you are in CVS! L'Oreal Infallable Pro Spray & Set Makeup Extender Setting Spray: OMG ya'll...look...a *drugstore* makeup setting spray! Finally!!! I am quite a fan of my Skindinavia setting sprays. However, I sure like the convenience of being able to pick up a setting spray at the drugstore for a drugstore price! L'Oreal was really smart to tap into this market. As a daily powder foundation user (powder foundation is my go-to for everyday makeup...just a dusting of powder for light coverage), I like being able to finish my makeup off with a setting spray for extended wear. This spray works great! It performs, for me, just as good as my high end sprays! Grow Gorgeous Overnight to Gorgeous Hair Masque: I have very long highlighted, dry, and somewhat damaged hair. I need weekly hair treatments to keep my hair shiny and manageable. However, I am always a hurry to get ready in the mornings as a SAHM with a baby and a 3 year old to take care of. My showers are always rushed! So, I can really appreciate a nightime hair mask that works...while you sleep! You simply generously apply this to your dry hair at night before bed. I braid my hair to keep it out of my face and put a towel on my pillow. Then when you wake up, you wash your hair as usual. It is that easy! My hair is left shiny and conditioned. Plus, the product smells very soothing while you sleep! Granted, this is a high price for a drugstore item. However, I do appreciate that you can get such good quality hair products at the drugstore now (just watch for coupons and sales to bring that price down!). 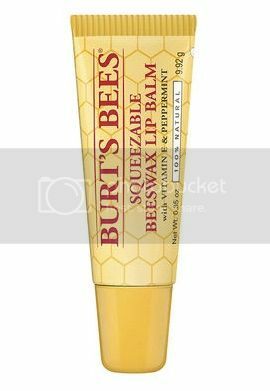 Burt's Bees Squeezable Beeswax Lip Balm: I have a long-standing love affair with Burt's Bees Lip Balms. I have used them for years and just absolutely adore the scent/taste! Plus, I love being able to use a 100% natural product on my lips. I apply it so frequently (and you know you end up ingesting it...so, you might as well go natural, right?). I really like the consistancy of this squeezable balm. It seems to sink into your lips right away and it leaves them hydrated, shiny, and minty. I am kinda addicted to the minty feel and taste of this lip balm! I admit, I am obsessed!!! Revlon Ultra HD Lip Lacquer: Oh Revlon, how I love your glosses! If Milani is my favorite for drugstore blushes, then Revlon is certainly my favorite for drugstore glosses! These Revlon Ultra HD Lip Lacquers were new for Fall 2014. They are really more like a liquid lipstick than a straight up gloss. The pigmentation and glossy finish is just beautiful. Not to mention the packaging...swoon! With the acrylic jewel on top and the sleek tube, this product looks high end! So, that is it! Those are my Top 10 (Well, I ended up picking 9 items, lol) NEW Products from the Drugstore! What are you loving from the Drugstore lately? Is there anything else that I "need" to try??? I just picked up the L'oreal Dry It Primer spray last week, and love it! I haven't timed it yet, but definitely feels like it takes a shorter amount of time to dry. The smell is nice too. It does make my floors slick, so I try and spray it in my carpeted bedroom instead of the bathroom. I didn't know that Grow Gorgeous was available at the drugstore. Mine came from Gloss48. I ordered the serum when their sale was on and can't wait to get it. I'll go look for the L'Oreal setting spray. I hope it's not fragranced. Great picks. That Nivea stuff is great isn't it! Those Milani blushes are my everything!